RSS Feed for keyword: "Banff National Park Pictures"
Banff National Park is nestled in the Rocky Mountains of South Western Alberta. 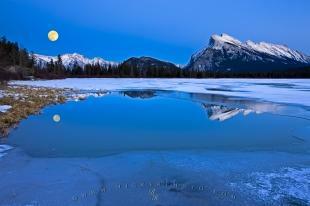 Banff can boast much more than just being Canada's first National park. Here, downhill and cross-country skiing, back-country hiking, ice climbing and mountain biking are unsurpassed. Lake Louise in the heart of the park has been developed as a high-class tourism destination, but even intrepid adventures will be thrilled with ice skating in winter or canoeing the glacier waters in summertime. Indeed, Banff offers visitors the chance to be rendered speechless by many clear blue lakes, all surrounded by rugged peaks. Lake Moraine and Peyto Lake, to name a few, and each is more beautiful than the last. For an exclusive ski time, try Sunshine Village, accessible only by gondola- no cars allowed! 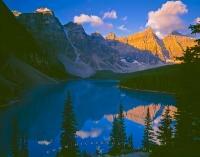 Check out our Banff pictures to see the difference yourself. Interesting Photo galleries related to "Banff National Park Pictures"
...Continue gallery information: Johnston Creek and Mistaya canyons are sculpted in limestone by centuries of cold mountain water. Each year, frozen waterfalls give ice climbers new winter challenges but don't forget safety first. The pristine snow and ice is avalanche territory, and beginners should not venture out without a guide and proper training. 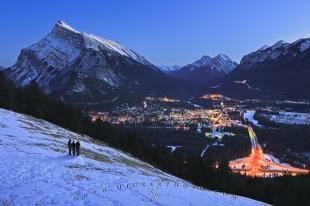 The town of Banff is the highest town in Canada at 1397 meters, (4540 feet). It is dedicated to conserving nature at their front door, and nature cooperates - often deer, elk, and bears are seen within the town limits! For the two-legged visitors, Banff caters to outdoor adventures and tourist services, everything you need to enjoy your visit to Banff National Park.